Aly’s Prom Closet provides the resources to ensure that financially challenged teens can attend their prom. Aly’s Prom Closet provides dresses, shoes, tuxedoes, shoes, boutonnieres, corsages hair styles, make-up, prom tickets, and other related expenses to make their special night memorable. 2010 – The Northern Nevada Chapter sewed 78 prom purses. 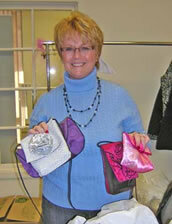 2009 – Northern Nevada Chapter sewed 38 prom purses for local prom bound teens.